Through a generous donation from DTE, Wayne State is able to provide researchers with access to digitized copies of aerial photos of Detroit and area for the period 1949 to 1997. The collection consists of a series of low resoloution (72 dpi) and high resolution (600 dpi) pdf files. 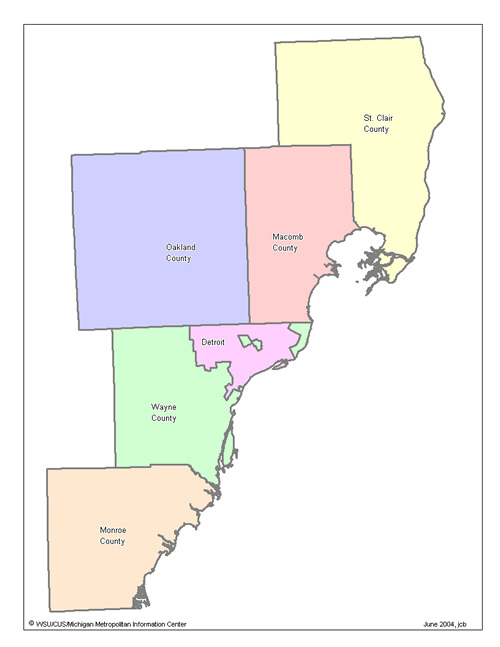 Use the links below to open a base map of a county for a given year and then use the links on the base map to open a photograph. The 600 dpi files are, on average, 15 MB in size and, on a high speed connection, take up to a minute to load. On a dial-up connection they will take significantly longer. The collection works best in Internet Explorer. Scroll down to "Portable Document Format (pdf) - change the Action to "Use Adobe Acrobat (in Firefox)"